Char Dham Yatra : Since ages both God and Man have had just one entreaty i.e. Shanti or peace both for the living as well as the dead. Chardham is also known as Doe Bhumi meaning the Adobe of the Gods. This Chardham Yatra is the one single phrase around which all the religions hold their discourses. Once a pilgrim reaches there true spirituality and peace is felt because of the pure splendor and the serene beauty. The Chardham is the experience for a lifetime with nature at its best. 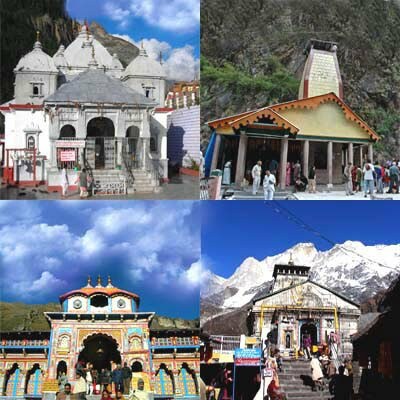 The Chardhams are Yamunotri, Gangotri, Kedarnath and Badrinath. As the Hindu scriptures abide, Char Dham Yatra means ‘four sacred places’. There is no Yatra sacred than this as pilgrims believe. It is a perfect example of Hindu faith in God. People believe that visiting all of these sacred Dhams will rinse away all the sins and also free the person from the continuous cycle of birth and re-birth. There is rule for visiting these sacred temples. One has to start from left and then proceed towards the right like Yamunotri, Gangotri, Kedarnath and then Badrinath. This route is called the parikrama or the religious cycle. The Himalayas are incomparable. This grand and haughtiest chain of the world succeeds in attracting pilgrims and visitors from all around the world. The place signifies beauty and calmness. The Chardham are the Himalayan shrines. They obtain water from the four holy streams namely, Yamuna (Yamunotri), Bhagirathi (Gangotri), Mandakini (Kedarnath) and Alaknanda (Badrinath). These majestic mountains have inspired various pilgrims and saints throughout the world. Here in the Char Dhams disciples from all over the world come to pay homage to their deities braving the nature’s furies.